Things just seem to spiral like that for us. When we decided to remove our disintegrating carpet, we opted not to go with carpet again. We have pets and allergies and I cannot stand the thought of what collects in and under the carpet. 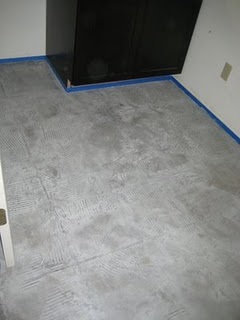 We chose to go with a concrete overlay that could be put right on top of our old concrete sub-floor. It was cheap, durable and fairly easy to work with. We wanted the whole floor to be uniform, so up came the tile in the kitchen. 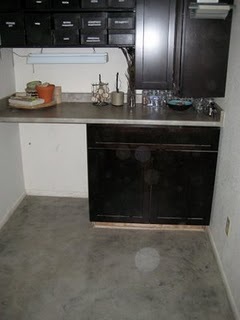 We knew that at some point we would want to update the cabinets, and that should happen before the floor in case the footprint was different (and it was), so we ended up involved in a kitchen remodel simply because we needed to replace the carpet. This has been going on for longer that I’d like to admit. We are finally getting to the point when we can put the floors in, but we have to go in stages since we are living in the house at the same time. First up was the laundry room to test out the colors we had selected. Above is the laundry room before the overlay. The washer and dryer are behind me. 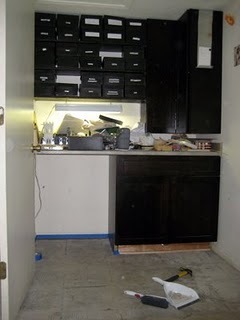 This is my craft supply area created from cabinets we rejected because they had warping or other problems. The manufacturer didn’t bother to collect them, so we’re making the best of them! Pardon the mess, with everything getting moved around lots of my supplies were found and piled on the counter. You can see mortar lines still on the floor from our tile. This is the only room that we did not grind the floors, and it ended up causing some issues with the overlay. This is the first coat of the overlay (we used a product called Skimstone). The Skimstone is troweled on in very thin layers. The first layer is the thickest and fills in imperfections in the surface, however it was still a bit too thin to fill in the mortar lines completely. If I had to do it over, I would have mixed this a bit thicker and really made sure the first coat was perfect. Using the primer would probably have helped a ton as well! 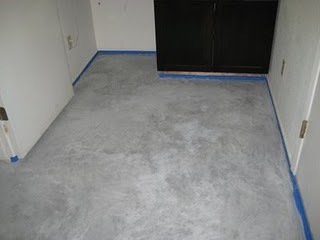 Skimstone comes is a variety of colors, we are very plain, boring people, so we chose to go for a natural concrete look. I really like the Industrial Gray, but in order to match our counter tops we had to mix in a little Classic Black to warm it up. As we move out of the kitchen and into the rest of the house, I plan to reduce the amount of the Classic Black. Normally when using Skimstone, you would apply three coats of the overlay, but we were still having a difficult time with the mortar showing through at that time, so we ended up doing several more coats. Unfortunately one of the pigments was very difficult to mix in to the solution and on one of the coats, I was unaware that it had not mixed in completely. As I put down that coat, flecks of the pigment kept showing up and this caused streaking and spotting that was much darker than the other areas. To top it off, the Skimstone develops a chalky white surface as it dries, making it difficult to see where my problem spots were. When sealed, the chalky appearance goes away, and it darkens the overlay a bit as well. The final coat of overlay was gently sanded to eliminate raised areas and give it a very smooth texture, wiped down to get rid of the dust from sanding and left to cure for a day. At this point, the color appears fairly uniform and quite light. Here is the floor after five coats of sealer have been applied. (Sorry about the dust on the camera.) Applying the sealer is the easiest part of the job! You can really see how the darker areas are much more visible now. Part of the overall darkness is the lighting of the room (day vs. night), as well as everything not having cured completely yet. The floor is somewhat lighter today, but not a ton. I’ll have to take more pictures in about a week to really give a good idea of the final outcome. Thin out the colorants so that they are easier to work with and measure. After dealing with the dark specks due to the pigment not being mixed completely, and the frustration of not being able to accurately measure minute amounts (.02 oz. or .12 tsp), I decided to thin out the colorants. I added 1 part colorant to 6 parts solution, and mixed, mixed, mixed them up for ages. If you do this, be very accurate, take your time and keep notes if there is any chance that you will need to mix up more. You’ll have to also adjust your “recipe” to compensate for the thinned solution. I also converted everything to ml and used medicine droppers that measure in .01 ml increments (I have these from fostering animals, but they are often used for dispensing medicine to babies as well, check with a pharmacist). Unfortunately I didn’t do this until the last coats, but plan on it for the rest of the floor. If you are planning on using only one color and one strength of color, then you should just mix the colorant into all of your solution at once as the directions say, but I would suggest still thinning out any thick colorants first with a little bit of solution. Make a sample board or two and play around for a bit. I made 20 chipboard samples to get a feel for how the colors would work together, what was the best way to layer them, etc… I discovered that: if you add a lighter color on top of a darker color , you get a more marbled look. If you do darker on a lighter color, it fills in and deepens the color, but creates softer transitions between the colors. The dark colors really shine through the lighter top coats, however the lighter colors seem to soak up the dark top coats and not as much shines through. By doing some samples, you get a feel for how the materials work, the consistency the mixture should be, and how quickly it dries in your climate. You can also take the samples around to see how they will look in different lighting and rooms. I had a sample that I loved in one room, but was way to dark for another. Remember to use sealer on your samples as well and keep notes on what ratios you used and what you did. Have someone on hand to mix up more when you think you may not make it, because by the time you get more mixed, that coat will have dried and the colors may be off. It also helps to have someone else stirring the Skimstone to keep it from hardening. It’s a pain to stop and stir when you are on a roll. They can also be the one handing you paper towels when you splash it everywhere (maybe that’s just me!). Be Flexible. Humidity, time between coats, uneven areas of the floor can all effect the outcome. That’s part of the beauty of concrete. This is not acid staining. Acid staining is usually done on pristine floors that were poured for that purpose. I have seen acid staining done on an overlay, and it was beautiful, but it involved a lot more work than Skimstone. Do not expect to have a result like acid staining. One of our reasons for choosing Skimstone was the impact it would have on the environment. Now I am sure there are much better options out there (I would have loved bamboo or cork), but many were not possible for us at the time we decided to go this route. I have no idea what chemicals are in Skimstone, just that it is a latex modified cement. 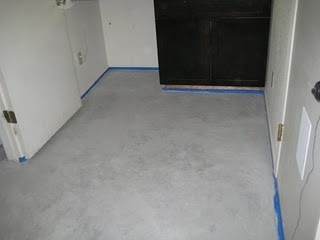 What we took into account was the amount of product needed to create the floor (approx. five 5 gallon buckets worth to do the whole house), minimal packaging to get rid of, durability, ability to repair if damaged, and the amount of waste produced if removed in the future (carpet, tile, etc… could be placed right over the skimstone, it’s paper thin). Overall it seemed less wasteful to repair our existing slab floor with Skimstone than put another product over it, especially considering the small amount needed to do the job.